Texas Red® Fast Conjugation Kit (ab195225) uses a simple and quick process to conjugate an antibody to Texas Red®. It can also be used to conjugate other proteins or peptides. The conjugated antibody can be used immediately in WB, ELISA, IHC etc. No further purification is required and 100% of the antibody is recovered for use. Learn about buffer compatibility below; for incompatible buffers and low antibody concentrations, use our rapid antibody purification and concentration kits. Use the FAQ to learn more about the technology, or about conjugating other proteins and peptides to Texas Red®. 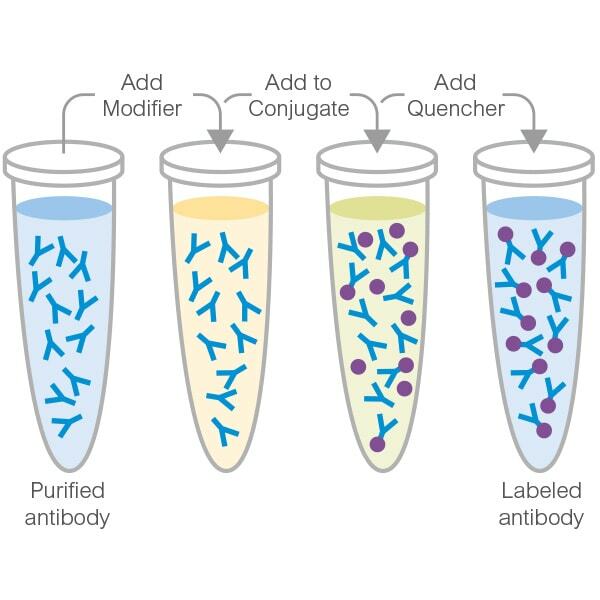 1 Using the maximum amount of antibody may result in less labelling per antibody. 2 Ideal antibody concentration is 1mg/ml. 0.5 - 1 mg/ml can be used if the maximum antibody volume is not exceeded. Antibodies > 5mg/ml or < 0.5 mg/ml should be diluted /concentrated. Buffer should be pH 6.5-8.5. If a concentration is shown, then the constituent should be no more than the concentration shown. If several constituents are close to the limit of acceptable concentration, then this can inhibit conjugation. 2 1% BSA gives lower quality conjugates, BSA can also interfere with the use of the conjugated antibody in tissue staining. If a constituent of the buffer containing your antibody or protein is not listed above, please check the FAQ or contact us. Only purified antibodies are suitable for use, ie. where other proteins, peptides, or amino acids are not present: antibodies in ascites fluid, serum or hybridoma culture media are incompatible. Store at -20°C. Please refer to protocols. Our Abpromise guarantee covers the use of ab195225 in the following tested applications. Conjugation Use at an assay dependent concentration. ab195225 has not yet been referenced specifically in any publications. Publishing research using ab195225? Please let us know so that we can cite the reference in this datasheet. There are currently no Customer reviews or Questions for ab195225. Please use the links above to contact us or submit feedback about this product.